An introduction to the new Johnson & Johnson Vision Care portal for opticians and their staff. Johnson & Johnson Vision Care Middle East, a division of Johnson & Johnson (Middle East) Inc., is committed to transforming the world's vision. We strive to increase awareness of the importance of vision and vision care and to provide the world's best vision correction choices. Johnson & Johnson Vision Care Inc traces its origin back to Frontier Contact Lenses, a company founded in Buffalo, New York, in 1959 by Dr Allen Isen, George Sitterle and Dr Feinbloom. With 30 employees, Frontier manufactured a line of hard contact lenses through the 1970s. Its early growth was attributed to its highly successful toric lens. The company added soft lenses to the product line in the late 1970s, and shortly afterwards began making its own soft lens plastic blanks. Frontier was among the first in the US to take this material, widely used in Europe, and combined it with the lathe cutting process to produce soft contact lenses. After moving operations in the early 1960s from Buffalo, New York to Jacksonville, Florida, Frontier experienced exponential growth. Johnson & Johnson acquired Frontier in 1981 and renamed it Vistakon – this was to be the beginning of a very exciting three decades in our history. In the mid-80s Johnson & Johnson bought the rights for the Danlens technology from Michael Bay. This was SSM – a unique multi-patented process which allowed the company to mould lenses in a continuous soft state. This provided an entirely new standard of precision, eliminating the hydration distortions common to traditional hard state manufacturing. The result was a high quality lens that was virtually 100% repeatable and reproducible, combining excellent vision with comfort and convenience. In 1987 Vistakon changed the vision care industry forever with the invention of ACUVUE® – the world's first disposable soft contact lens. The launch of this product was first in the US, then the UK became the first European market to bring this unique product to Eye Care Professionals during 1988/89. The response was amazing and this new way of wearing contact lenses completely revolutionised the UK market. Patients and practitioners alike embraced the idea of throwing contact lenses away after one or two weeks of wear, dependent on the recommendation for the patient. ACUVUE® was followed by the introduction of SUREVUE®, which enabled Eye Care Professionals to offer patients more choice. By 1994, ACUVUE® and SUREVUE® accounted for nearly two-thirds of all new patients coming into contact lenses within the US contact lens market. The next huge breakthrough in the contact lens market came in 1995 with the introduction of 1-DAY ACUVUE®; the world's first daily disposable contact lens that made contact lens wear more convenient for millions of wearers. They were designed to be worn for a single day, then thrown away and replaced with a brand new, sterile pair, eliminating all contact lens cleaning and care. Some of the benefits were an unsurpassed level of comfort at that time, healthy crisp vision, convenience and cost elimination for cleaning solution products. Continuing with the series of firsts, in 1994 Johnson & Johnson Vision Care was the first contact lens manufacturer to advertise the benefits of contact lens wear to consumers through mass media – the response was remarkable. Today this is very much the norm with many retailers and manufacturers advertising contact lens brands. The 90s saw the introduction of many disposable contact lens brands, both in the daily disposable and the frequent disposable modalities. All lenses were made from hydrogel materials. It wasn't until the beginning of the new millennium that we started to see the introduction of silicone hydrogel contact lenses. Johnson & Johnson Vision Care launched their first silicone hydrogel lens in 2005 with the introduction of ACUVUE® ADVANCE® with HYDRACLEAR®. This was followed 15 months later with ACUVUE OASYS® with HYDRACLEAR® PLUS. However, the innovation didn't stop there. Johnson & Johnson Vision Care continued to push the boundaries of contact lens development with the introduction of ACUVUE® ADVANCE® for ASTIGMATISM, 1-DAY ACUVUE® for ASTIGMATISM, 1-DAY ACUVUE® MOIST and later ACUVUE OASYS® for ASTIGMATISM – a totally new toric lens design that employed the outstanding stabilisation features of Accelerated Stabilisation Design (ASD) Technology to allow the lens to settle accurately in the eye in 60 seconds. It has been an exciting journey – we've delivered huge changes in contact lenses, bringing more benefits to patients and helping them live their life to the full. Johnson & Johnson has always believed that innovation and pioneering endeavour is paramount and it is illustrated by our credo: Research must be carried on, innovative programmes developed…and new products launched. With this at our core we aim to continually innovate and bring you the latest advancements. 2. JJVC data on file 2012. Based on commercially available product parameters. 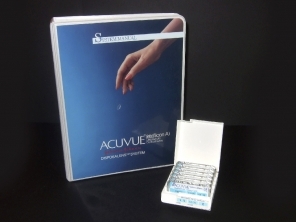 August 2012; 1•DAY ACUVUE® MOIST for ASTIGMATISM range 2.8 times more parameters than closest competitor.